Quentin Tarantino and Hall H are made for each other. It’s a feedback loop of pure enthusiasm. 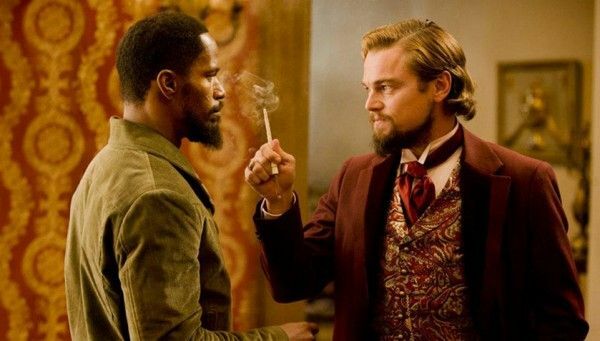 The trailer for his latest film, Django Unchained, was met with lots of love, and all of his fans have been chomping at the bit for more. Tarantino doesn’t hand out spoilers, but he’s not disturbingly protective to the point where he’s scared to show a single frame of his movie. He’s a guy who’s always proud of his work, and he wants to share his excitement. At Saturday’s opening Hall H panel, I couldn’t have been more excited to see Tarantino share his latest pride and joy. The moderator opened by bringing out cast members Jamie Foxx, Christoph Waltz, Kerry Washington, Walton Goggins, and Don Johnson. And then the man himself: Quentin Tarantino. Hit the jump to check out the recap. He says the movie can’t be more nightmarish or surrealistic than it was in real life, so it’s perfect for a Spaghetti Western interpretation. When he first met with Tarantino, Foxx talked about growing up in Texas and being called the n-word by people, but by having that done to him, he was able to grasp what was in the script because it had been done to him. He adds that a project becomes special for an actor when it parallels their own story. Tarantino says he didn’t really do a movie about a slave, and he wanted to do a slave narrative and that brutal time, but one of the fun and exciting things was to take the western and take that story and place it in the Antebellum south and put a black character at the center and deal with it. Schultz is the experienced gunfighter who teaches the know-nothing kid, because that’s a trope of the genre. Schultz is “unsavvy about the realities and cruelties of the South vis-à-vis witnessing it personally.” But when they get into the thick of it in Mississippi, it’s Schultz who is out of his element and Django knows what’s going on, so the dynamic is flipped. Waltz says that also corresponds to his personal experience because he grew up in Vienna, Austria. Tarantino says Schultz has an interesting backstory that’s not in the movie, but there’s a reason why he would be enlightened. The “doctor” part of Schultz is because he’s a dentist. Tarantino says it wasn’t lost on him the Doc Holliday connection, but it was more that he dentists are precise, there’s tooth extraction, and he has a dentist wagon so he has a reason to show up places and hide in plain sight. We see the part from the trailer where Schultz gets Django from the chain gang and guns down the slave owners. What we haven’t seen is how Schultz blows one of their heads off. 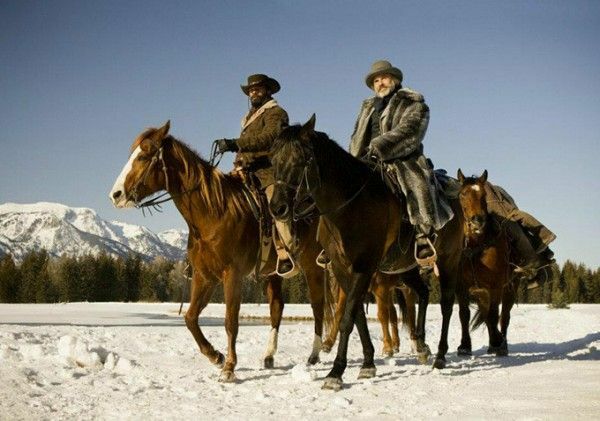 Again, as we’ve seen in the trailer, Schultz lays out the arrangement with Django: Django helps Schultz go from plantation to plantation to hunt down the Brickle Brothers, and in return Schultz will help Django rescue his wife Broomhilda. We see Schultz training Django to shoot by using a snowman as a target. We then go over to Big Daddy’s (Don Johnson) plantation with Django posing as Schultz’ valet (wearing the ugly blue outfit we’ve seen in the trailers), and the two of them arrive under the ruse of wanting to purchase one of Big Daddy’s slaves. 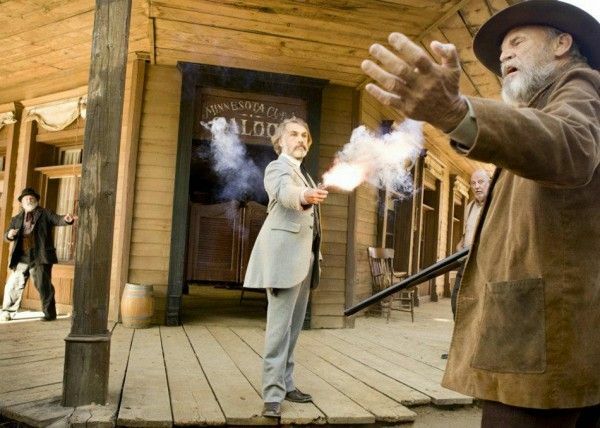 Big Daddy tells one of his slaves to take Django around the plantation, and Schultz stresses that Django is a free man. When the slave is taking Django around, she refers to Schultz as Django’s master. “Didn’t you hear what he said? I’m a free man.” “And you choose to dress like that?” she responds. We then see that Django discover one of the Brickle Brothers on Big Daddy’s plantation, and the Brickle brother is about to torture a slave who has broken some eggs. That’s how we get to the “I like the way you die, boy,” moment from the trailer. Then we see Django take down a white guy who’s whipping a slave. There’s some of Calvin Candie (Leonardo DiCaprio) mixed in, but it’s almost entirely stuff that’s been in the trailers. Then we see a lot more violence (there’s definitely going to be some bloody kills in this film, as you probably devised from the all-audiences trailer). The moderator goes back to talking to the cast. Goggins says he plays Billy Crash, the mandingo slave fight trainer for Candie. There’s nothing redeeming of the character, but the character is from a working-man perspective. Tarantino says Jackson plays Steven, the house slave; the relationship between Candie, Steven, and Crash is because it relates to modern day corporations, except then the plantation was more like a family. Families could corner the market because they had slave labor. Steven and Billy Crash are like the two CEOs of the company. Steven runs the house, farm, and business aspects. Crash manages the mandingos. Steven may be a slave, but he’s not sympathetic. However, Steven is basically Candie’s father because he raised the character. Steven is the only person Candie listens to. All of the slaves are scared of Steven, but his personal situation is great (at the expense of everybody else). The interesting thing Tarantino found about writing about these characters is it’s like a buccaneer fighting a king whose property could be 65 or 100 miles long. Inside of all those people living on the land are the subjects of the plantation owner. Steven’s character would be like the Basil Rathbone‘s character in the old swashbuckling films. Johnson says Big Daddy is the “kinder, more lovable plantation owner. My slaves love me.” “That’s what they all say,” Washington quips. Tarantino makes a quick aside that they have Crockett and Tubbs in the same movie. Johnson says that he could step into the character of Big Daddy in making him big and flamboyant, but not diminish the importance of what was happening in the time period. “He’s funny and bad,” says Johnson of Big Daddy. As for the character’s voice, he studied Foghorn Leghorn. By studying the German four hours a day and the horseback riding helped Washington connect to the world especially at the times when she just wanted to hide under the covers from the brutality of the story. Django’s journey mirrors the German fairy tale of Siegfried’s journey of rescuing Broomhilda. It’s a legend that would mean something to von Shaft. Because slavemasters didn’t want marriages, Django and Broomhilda were married in secret, but because they’re sold in different direction, they would probably never see each other again. 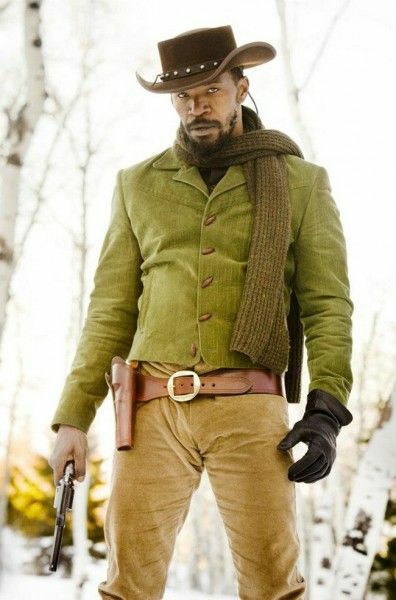 Even though he gets his freedom, Django’s willing to go back into the pit of hell to rescue his love. There’s still one more of week shooting left to go. Jonah Hill finished shooting his stuff last week. Tarantino prefaces that the predecessor to the Ku Klux Klan were the “regulators”, and Hill’s character is with Big Daddy. Their scene is one of things that Tarantino thinks “is one of the funniest things I’ve ever written”, but he can’t go into details. He does say that it’s something about Ku Klux Klan-ism that’s never been said before, and when he read the bit to a friend, they busted out laughing. Tarantino says it’s up there with the handing out of the color names in Reservoir Dogs. There is one character who is a forebearer of another Tarantino character from a previous movie, but he’ll let the fans figure out which one. He does joke that Django and Broomhilda are the ancestors of Detective John Shaft. What did Tarantino give his cast for reference in terms of films: Of the group on stage, he only gave Washington some homework (because she was the “super-inquisitive one”), so he pointed her in the direction, particularly the stuff from the 30s and 40s that dealt with the Antebellum south and not in an unbalanced way. He gave her The Flame of New Orleans from French director René Clair. He says the film is a refreshing portrayal from a master filmmaker. He also gave her The Spoilers. Washington adds that at some cast dinner that Tarantino references a movie Johnson starred in, Return to Macon County, and Johnson didn’t even remember doing, and then Tarantino started rattling off the art director, best boy, etc. 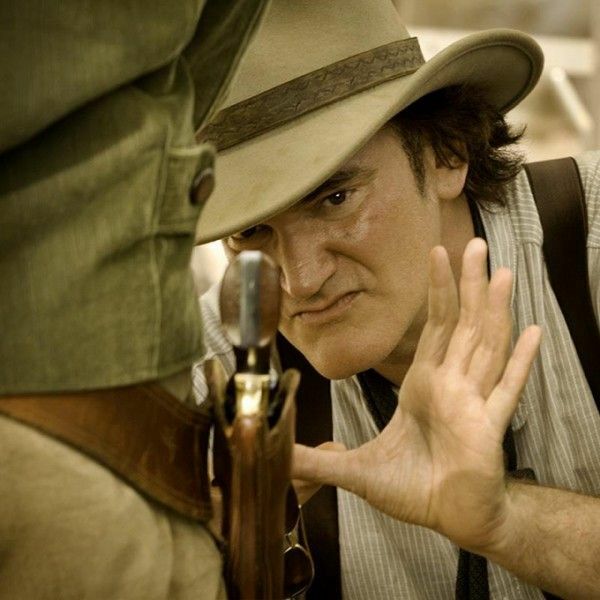 Tarantino directed Johnson to Sergio Corbucci‘s Minnesota Clay. Corbucci also directed the original Django starring Franco Nero. Tarantino considers this and Kill Bill to be his two biggest adventures in filmmaking. This was a great start to a big day in Hall H. As you can tell from this write-up, a lot of stuff was discussed but without spoiling the movie. It was a really intelligent conversation about the relationships between the characters, their motivations, the movie’s influences, and what will make Django Unchained stand apart from other westerns. Judging by this panel, Django Unchained is going to be like Tarantino’s other films: something special. 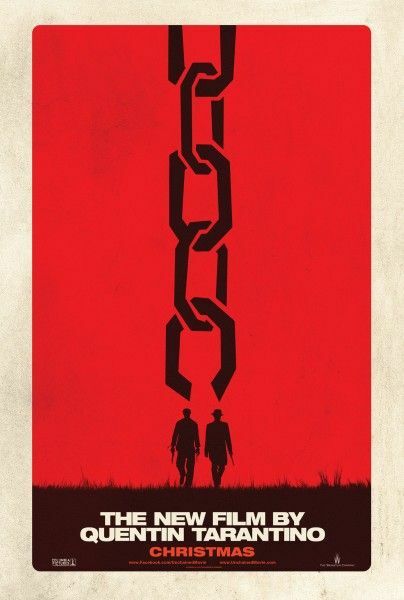 Django Unchained opens December 25th.